WIN Data was created to provide the largest and most accurate set of data points and contacts for the North American wine industry. Our WIN Data research team is hard at work providing the most up-to-date winery information available. Information is updated daily! Designed to work on your phone, tablet or desktop, stay connected with WIN Data no matter where you are. In today’s competitive selling environment, knowing which businesses to target and who to contact is the difference between winning and losing. WIN Data PRO is designed specifically to make that easier. Wine Industry Database provides Professional Users with a complete set of tools to segment winery and vineyard information in an easily customizable format. Pro Users can save reports, segment additional data points, create mailing labels or export into several popular formats. 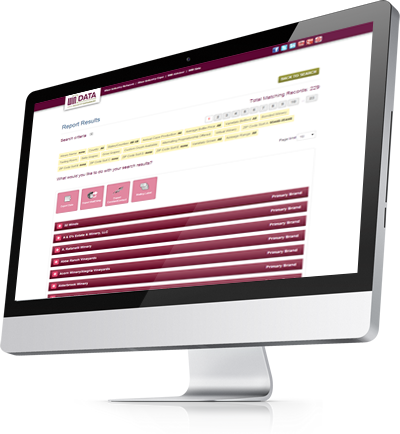 Designed for Wine Industry Professionals, WIN Data PRO provides immediate access to the most accurate information available. Search by winery name, region, varietal, price point, case production, vineyard size and more. When you find what you’re looking for WIN Data PRO makes it easy to download results so that you can begin the process of connecting with prospective customers. Export search result contacts by job type, including Owner, Principal, Winemaker, Vineyard Manager, Tasting Room, Wine Club, Finance and more. Exported data can be formatted as an XLS or CSV file, multiple Avery mailing label types or sent directly to MailChimp or Constant Contact via our powerful API. Some of our data is free. Seriously. Try it out. If you’re interested in more than just a winery name or address, or you want to export that information for a larger scale marketing campaign, then WIN Data PRO is for you. Save Previous Searches for easy "Report Refresh"
Annual subscriptions to WIN Data Professional provide full access to the WIN Data platform. WIN Members receive a discount when signing up for WIN Data. Email Buffy Schaezlein or call 707-433-2557 x102 for more info. Sell more. Get started with WIN Data Professional access today. Please contact us for more information or a demo of WINData.